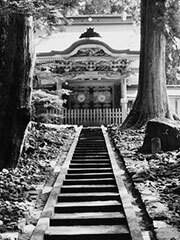 Eihei-ji (永平寺) is one of two main temples of the Soto sect of Zen Buddhism. Eiheiji is located about 10 km east of Fukui City in Fukui prefecture, Japan. Its founder was Dogen Zenji. Eiheiji is the main training temple of Soto Zen. The standard training for a priest in Eiheiji is a two year period of practice.